Software to merge multiple PDF files in seconds! 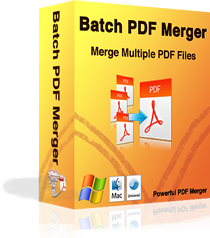 Batch PDF Merger is a desktop program that will quickly merge multiple PDF files into one large file on your Mac or Windows desktop in literally seconds. The software allows you to merge large PDF files with the ability to arrange them in any order — right on your desktop. Drop your PDF files into the application's window, rearrange the files, then click merge - that's it!